Vienna is one of the cities that I simply love. I was there a couple of times, and I cannot wait to go back. It also happens to be the most liveable city in Europe – and the second one worldwide – according to the The Economist Intelligence Unit’s Global Liveability Report 2017. 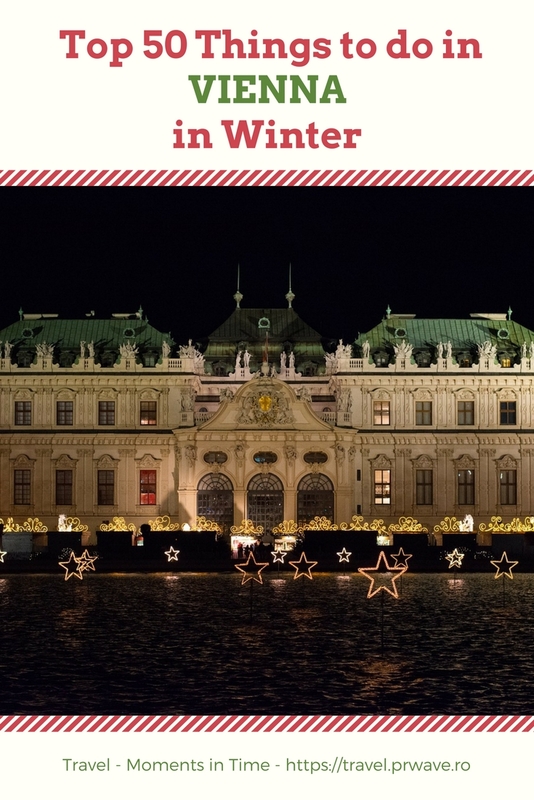 There are many wonderful things to see and do in Austria’s capital all year long, but today I want to present you the top 50 things to do in Vienna in winter. 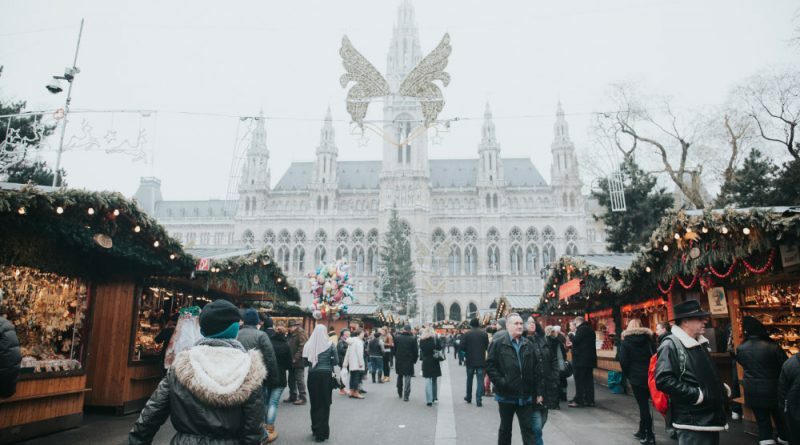 From great cafés and bars in which to warm up to the famous Christmas market, and from wonderful museums to other interesting places to see and activities to try, Vienna is a perfect winter destination for everyone who loves big cities. 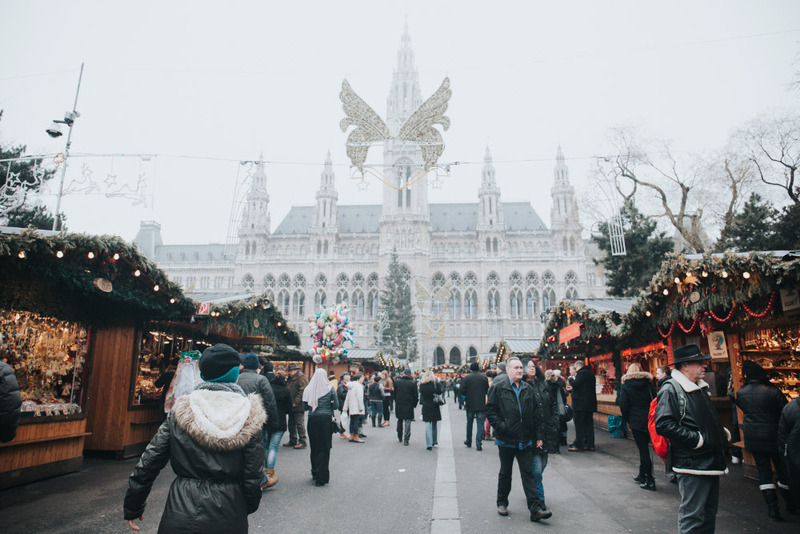 Have fun at one of the Christmas Markets – each year, Vienna becomes the home of wonderful Christmas markets that you shouldn’t miss. Enjoy Eisstockschießen – Bavarian curling. It’s fun, and you can usually try it in several places during the winter, including in front of the city hall. Attend a Christmas concert – they can be found mostly in churches, but the atmosphere is special. Have fun at the Silvesterpfad (‘New Year’s Eve Path’) – this is an annual event that starts at 2PM when the city centre becomes the party centre – several concerts take place here. Be mesmerized by the Kunsthistorisches Museum and its impressive collection of paintings, sculptures, and more. I loved it! Go ice skating – in front of the city hall – Rathaus – or on the ice rink next to the Konzerthaus. Discover a good cocktail – there are many bars in Vienna that offer great drinks! Enjoy the snow – go snowball fighting with friends in a park, or build a snowman. Or just walk on the fresh snow. Winter is great in Vienna! Get warm with a hot chocolate – yup, after all that walking in the snow, in low temperatures, a hot chocolate is just the “cure”. Taste the street side Maroni (chestnuts) and Kartoffelpuffer – it’s winter, so you shouldn’t miss them! Go waltzing at a Viennese Ball – in January and February. Go back in time, dress properly, and let the music guide your steps. Enjoy a magical live concert: The Vienna New Year’s Concert – it’s a classical concert performed by the Vienna Philharmonic that takes place each year in the morning of New Year’s Day in the city. The tickets are expensive, but the show is worth it. As a side note, many televisions across the globe transmit this concert. Visit the Technisches Museum – no matter the season, this museum is always a good idea. So many interactive exhibits, so many things to discover! Just read our comprehensive presentation of the Technical Museum in Vienna and you’ll see why you should definitely check it out! Try the Wiener Apfelstrudel – a local delicacy famous worldwide. Try it and you’ll see why! Watch a theatre performance – there are many theatres, including small ones, so, if you know German, go for it! Visit the chocolate museum. Yes, Shokomuseum is a must visit in Vienna for all chocolate lovers! Go to the cat cafe – yes, there is one in Vienna – Neko Cafe – and it’s all about great tea and amazing cats! Take a ski trip near the city – there are numerous places to choose from – and for sure an activity to include among the top 50 things to do in Vienna in winter. If the cold is not for you, then maybe a sauna is. There are several saunas in the city, as well as spas near Vienna to try. Check out St. Charles Church – Karlskirche, a special place in Vienna. Go to the Imperial Butterfly House to see lovely butterflies flying around. You wouldn’t believe it’s winter outside! Check out a brewery – taste beer, enjoy some pork knuckles or order something else. But enjoy the local atmosphere! Buy a souvenir – whether it is a fridge magnet, keychains or whatever you like, make sure you bring a little bit of Vienna home with you. Try some curling on the curling lanes on the Badeschiff Vienna Boards (the swimming pools are transformed into curling lanes from November to March). Definitely one of the top 50 things to do in Vienna in winter. Attend a classical concert – perhaps one focused on Vivaldi at Karlskirche (St. Charles Church). Try a Faschingskrapfe – a doughnut filled with apricot jam or custard. You can find them in almost all bakeries. Learn to waltz – it’s balls’ seasons, so if you want to go to a Viennese ball but don’t know how to waltz, now it’s the perfect time to learn! Don’t miss the chance to see Vienna from the famous Ferris Wheel – it is one of the most famous things to do in Vienna! If I mentioned the Ferris Wheel, then I should add that the entire Prater Amusement Park is a must see – there are numerous attractions that await you! Visit Saint Stephan’s Cathedral (Stephansdom), Vienna – this will turn into a unique experience, especially if you visit the catacombs as well. Go shopping – and take advantage of the season’s promotions. Yes, it’s winter, so you will definitely find Christmas sales and winter sales! Take a guided tour of the United Nations headquarter in Vienna. True, it’s open all year long, but if you are only in Vienna during the winter, don’t miss it. Try the Wiener Schnitzel – I loved it! Check out the Christmas lights – the city is beautifully decorated for the holidays! So, as part of the top 50 things to do in Vienna in winter, admire these lovely lights! 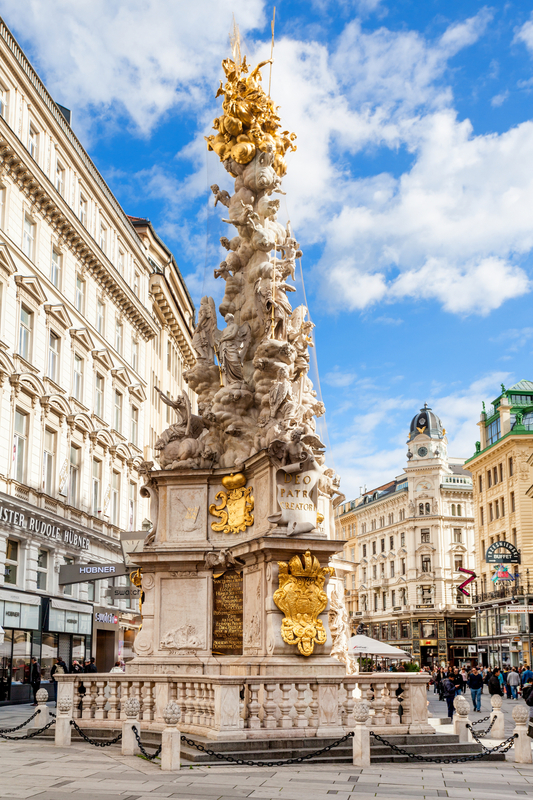 Go to an art exhibition – there are numerous galleries and art museums – these are the three best art museums in Vienna – plus there are special temporary exhibitions at various museums. Check out the Ankeruhr (Anchor Clock) – the public clock with human figures in Vienna, Austria. I loved it! Try the Wiener Würstchen – Viennese Sausage – usually a mix of pork and beef. I found several sausage to try when I was in Vienna. Discover Klimt at the Belvedere Palace. There are actually two palaces – the Upper and the Lower Belvedere – and you will see other artists there, not just Klimt. Admire the monuments in Vienna – for instance, the Vienna – The Red (Soviet) Army memorial „Heldendenkmal der Roten Armee”. Go to a classical concert at the Opera. This will be unforgettable! Taste a Mozartkugeln or Mozart balls, the most famous Austrian sweets. Learn more about the Viennese literature and famous Austrian writers, including Franz Kafka, at the Literature Museum of the Austrian National Library. Multimedia and various sources materials can be seen here. Eat some Tafelspitz – a traditional Viennese beef dish with spinach. Take many photos on Vienna’s streets – far from the touristy ones, you’ll find beautiful Gassen, sometimes cobbled, and the Christmas decoration and yellow light add even more charm to the scenery. Go to… Egypt – and see many papyri at the special Papyrus Museum. Try the Weihnachtspunsch – it’s the German traditional Christmas punch that you will easily find at one of the Christmas markets. You usually pay a deposit – and, when you finish your drink, you can either keep the mug as a souvenir, or get your money back. Take a trip with the Vienna Ring Tram to admire all the Christmas lights in the main touristy area – it’s a comfortable, warm way to see them all for those who can’t walk a lot, or who just need to take a break after a long day. Try the Käsekrainer sausage – hint: Käse means cheese in German. So, yes, it’s a sausage filled with cheese – when you cut it, you’ll see the melting cheese. Quite an experience. And great on a cold, winter day. These are the top 50 things to do in Vienna in winter. While some of them are available all year long, they are definitely great ideas in winter (some are actually more enjoyable, while others are perfect ideas for indoor things to do in winter – cold, snowy days. One thing is sure: Vienna is a perfect Christmas destination. You can always choose to spend your winter holidays in Vienna as you’ll have a lot to see and do. Everything looks awesome but those Christmas markets would be right near the top of my list. Seems so quaint, peaceful and serene, and quite unlike any else in the world. Definitely on my bucket list, to visit a Christmas Market in Vienna. Thanks for the rocking share. this is such a great list! so many wonderful memories coming back to me! Vienna was the coldest I had ever been in my life but it was so beautiful, I would for sure go back! Such a great list! I really have to get to some European Christmas markets! Great list! Would love to visit one day! Great list!! 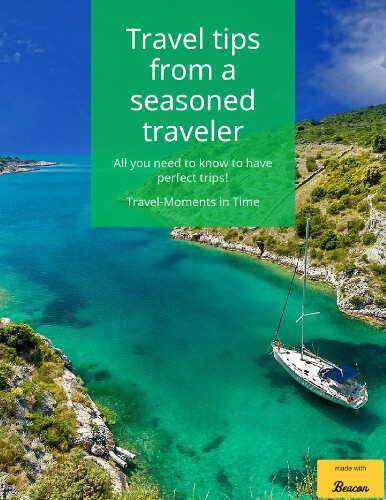 We are headed there this NY holiday and want to do all of these! Sounds like we will eat a lot, play a lot and see a lot!! This so made me want to go back and explore more. I visited Vienna on a lovely spring couple of days. Can’t complain, it was sunny and pretty, but I think this city inwinter puts on such an incredible vibe that no other season can match. I definitely want to go back in the winter! Love your tips! Vienna is a beautiful city on its own and it’s even better in Winter with festive celebrations around! Such a great list! 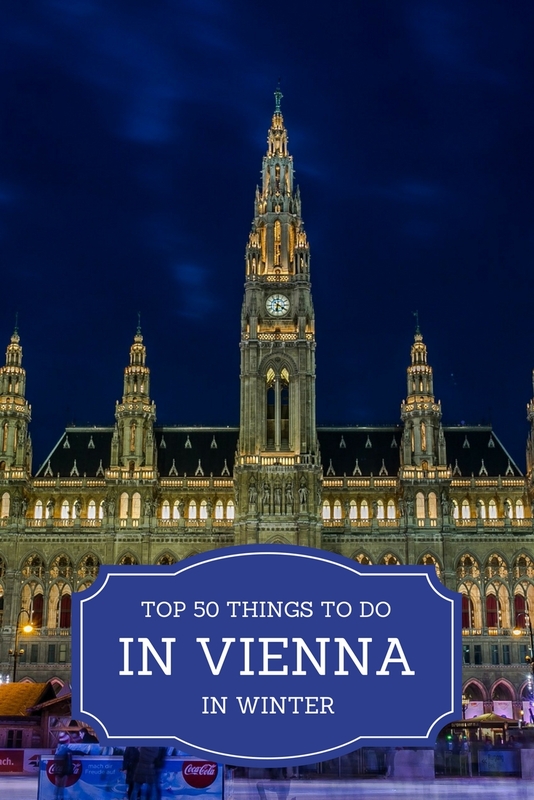 I wish I had known about this guide when I visited Vienna! OMG sausages filled with cheese?!! I think we might just be too early for ball season which is disappointing. Thanks for this guide.